CANTON, Mass. 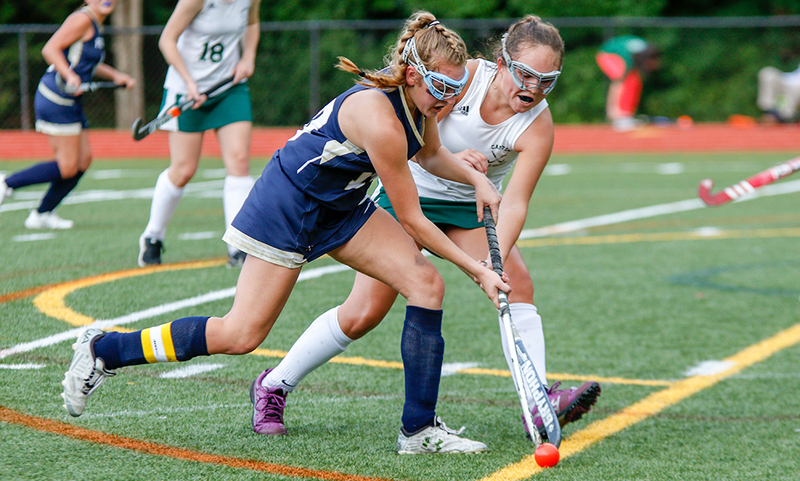 – In a battle between the top two teams in the Davenport division, the visiting Foxboro Warriors landed the first punch, but the Canton field hockey team delivered a counterpunch that led to a key 3-1 Hockomock League victory. Foxboro scored less than four minutes into the contest, capitalizing on its second straight corner after swarming the Canton defensive zone. But Canton didn’t sway, scoring three unanswered over the next 25 minutes to take a lead that it never surrendered. “We were slow in our warmup, the weather was off, we just took a little time today to pull it together,” said Canton head coach Chrissy O’Connor. “I think the goal woke them up a little bit and I think we did a nice job of transitioning from down a goal to taking control of the game. Foxboro cashed on its second straight corner after its first one was denied by Canton goalie Riley O’Connor (seven saves) and then cleared off the line by Katie Trerice. On the second corner, Michaela Ames found Lily Daly. Her shot was deflected, alluding O’Connor and found the stick of Sophia DiCenso. The senior used a strong backhand shot at the near post to put Foxboro up 1-0 with 26:50 to play. But instead of the Warriors adding onto the lead, Canton took complete control of the play. The Bulldogs earned a pair of corners and a penalty stroke. Although they didn’t cash in on those chances, Maggie Malloy got the hosts on the board at the midway point of the half. On a corner, sophomore Maria Femia found sophomore Kaitlyn Goyetch at the top of the area. She quickly passed to Malloy in the area and she hit a one-timer into the back of the cage to make it 1-1. The Bulldogs nearly took the lead a minute later when Maggie Connolly found Malloy in space and she unleashed a hard shot but Foxboro goalie Julia Carangelo came up with a big kick save to keep the score level. “They came right back at us, I think we took that one goal for granted,” said Foxboro head coach Melissa Bordieri. “[Canton] played well, came right back, and placed the ball well. We had, defensively, some pretty big breakdowns positionally. We were leaving gaps and kudos to them, they found them and used them. But as the half went on, Canton continued to apply pressure and was able to break through with just under nine minutes to go. Femia played a ball into the area, Malloy redirected it with one touch and Connolly tipped it in from right in front of the goal. The Bulldogs cashed in one more time before the half was over, scoring with just 57 seconds to go. Again it was a shot from Malloy from inside the circle that was tipped in by Connolly right in front that gave Canton its 3-1 lead. Foxboro made some adjustments at the half and applied a lot of pressure but couldn’t cut into the Bulldogs’ lead. Daly had a goal off a corner waived off with 13 minutes to go and just 30 seconds later, O’Connor denied DiCenso on a chance and Rose Malloy came up with a big clear off the line. Two minutes later, Ames connected with DiCenso on a corner and she moved the ball along to Daly but her pass to the far post was just out of the reach of Molly Murphy. “We had seven corners [in the second half], we need to execute better there,” Bordieri said. “We had seven opportunities to score just from corners, and we didn’t capitalize. We worked our butts off to get those chances, and we didn’t take advantage of them. Some of them we didn’t even generate a chance. [Canton] beat us to the ball today, they were quicker than us. Canton nearly added another tally on a counter attack as Malloy chased a ball down in space and found Femia but Carangelo made the stop at the near post. Foxboro’s final good chance came with just over nine minutes to go when DiCenso ripped a hard low shot through traffic but O’Connor was up to the task with a big lunging kick save. Canton field hockey (4-1 Hock, 4-2 overall) will look to make it three straight when it hosts Mansfield on Thursday. Foxboro (5-1, 5-1) will try to bounce back from its first loss when it hosts Attleboro at Mansfield High.